A method for calculating the hydrodynamic resistance coefficient of bodies of various form installed at the bottom of turbulent flow is examined. Using a power series velocity profile and the proposed calculation plan, which relates the resistance of a freely streamlined body and the object on the screen, a relation was derived between the appropriate coefficients of resistance of these bodies, taking account of the resistance of the screen. 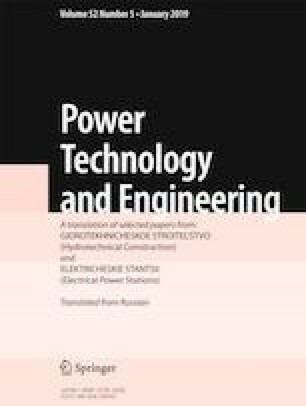 The materials in this paper are of timely nature, in connection with hydraulic engineering construction of various structures that interact with water flows, including pipeline systems for different purposes. Translated from Gidrotekhnicheskoe Stroitel’stvo, No. 10, October 2018, pp. 11 – 14.